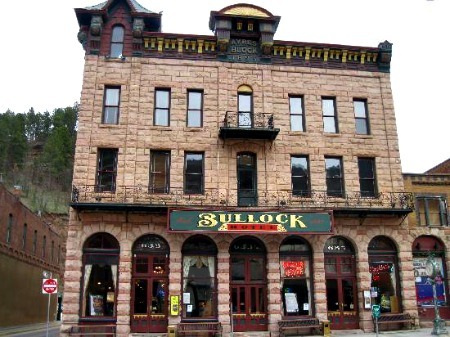 The Bullock hotel was built between the years of 1894 and 1896 by a man named Seth Bullock. It was the first hotel in the town of Deadwood and was built on the site of an old 2 story wood frame building which was destroyed during Deadwood's most destructive fire ever in 1894. The hotel remained as such through out the years until the Aryes family bought it and converted it into a hardware store. But in the year 1991 the building was purchased by Bullock properties and after substantial renovation was once again turned into a hotel which it remains as such to this day. The Hotel holds regular ghost tours and the adjacent Branch house boasts seven of the most critically acclaimed suites in South Dakota. There seems to be only one ghost at the hotel, though it certainly likes to make itself known. It is thought to be the spirit of Seth Bullock, the original owner where the common story is that he died in the hotel in room 211 on the 23rd of September, 1919 of colon cancer. He did in fact die on this date but the death was officially recorded as him dying in his own home. Perhaps the reason the story exists of him dying in the hotel is because it seems that it is certainly his spirit the remains in the building. He was thought to be a hard working, no nonsense and kind man who was very serious about the business he loved so much. Perhaps this is the reason that staff have felt his presence when they have been taking a break or slowing down with their work. There are a huge number of reports of staff members feeling as though someone is staring at them or standing right next to them, making them overcome with a paranoid, uncomfortable feeling, and only when they arnt working or have slowed down. Bullock is thought to be a friendly ghost as no one has ever reported any aggressive or unpleasant behavior from him, even when he has touched peoples hair in a light brushing past sensation. The second and third floors of the building have a very strong presence within them, almost as if there were a strong authority figure marching down the hall way towards them, making them feel intimidated and uncomfortable. People have also captured many orbs here, and claimed to have seen the apparition of Mr Bullock walking along the corridors and into rooms through closed doors, most of which seems to happen on the top two floors. The hotel holds regular ghost tours and has many stories to tell, and on top of that it is a beautiful building which boasts some incredible decor and architecture. If you are ever in the town of Deadwood this really is the place to stay.